S-nitrosation of a cysteine residue is an important post-translational modification affecting protein structure and function. A novel approach to detect this modification in the bare, charged amino acid is presented, based on IR multiple photon dissociation (IRMPD) spectroscopy. Protonated and deprotonated S-nitrosocysteine ions, [SNOCys+H]+ and [SNOCys-H]-, have been obtained by electrospray ionization and assayed for their dissociation activity upon irradiation with an intense flux of IR photons tuned in either the 1000-1900 cm-1 or the 3000-3600 cm-1 wavenumber range. The so-obtained Infra-Red Multiple Photon Dissociation (IRMPD) spectra display characteristic features ascribed to the presence of the S-nitrosation motif, which are missing in the corresponding IRMPD spectra of the native cysteine ions, [Cys+H]+ and [Cys-H]-. In particular, the NO stretching mode is unambiguously identified by the red shift observed for the 15N-labelled species. The thorough interpretation of the IRMPD spectra is supported by density functional theory calculations of the optimized geometries, relative energies and IR spectra of [SNOCys+H]+ and [SNOCys-H]-. Both sampled ions comprise a thermally averaged population of conformers contributing to the experimental IRMPD spectrum. This notion is supported by the fine agreement between the convoluted IR spectrum of the several conformers, each weighted by the respective factor in a Maxwell-Boltzmann distribution, and the recorded IRMPD spectrum. 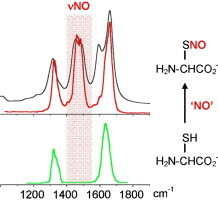 The gathered evidence points to a characteristic NO stretching mode that emerges as a pronounced feature at 1460-1490 cm-1 in the IRMPD spectrum of [SNOCys-H]-, namely in a region where [Cys-H]- displays no IRMPD activity. In contrast, the NO stretching vibration of [SNOCys+H]+ is masked in a wide absorption including the C=O stretching mode at 1780 cm-1. The [SNOCys-H]- negative ions are thus a promising benchmark in a search for S-nitrosation features using IRMPD spectroscopy.